Synthetic Planters - Design Led Planters from Ora Home Ora Home Ltd. Choosing superior quality synthetic means settling for nothing less than the very best. Not only that, but the possibilities are virtually endless: from semi-transparent and an artistically painted design to an eggshell or bamboo covering and a faux wood or metal finish. What better proof of the fact that synthetic can be truly elegant – and not just the gold and silver leaf models. 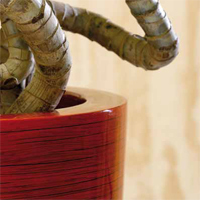 Not only are countless unique colours and finishes available, but also distinctive shapes like wavy lines, which would not be possible to create in any other material. 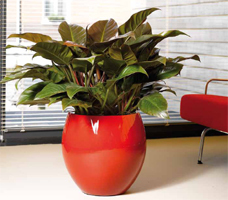 If youâ€™d like to combine attractive office greenery with sustainable production methods, have a look at the Artstone series. These products are made of recyclable materials that are coloured completely through. 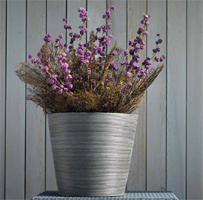 Many plastic planters are perfect for outdoor use, depending, of course, on the type of finish. They are also ideal for use in environments where they may be subject to rough handling, such as schools and other public facilities. Low in weight, they are easy to move, making cleaning and flexible layouts a breeze. We have over 100 products in our Synthetic Planters range.